Here's my latest creation. This took me quite some time to weave as I didn't rush it and each and every pick had to be done by hand with no plain weave other than the beginning and end. I believe there aren't any mistakes, or if there is, there are very few. 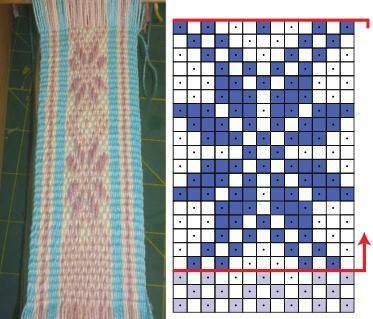 I especially like how the contrasting weft color became part of the design. I'll have to remember this should I weave this again or something like it. If I don't use this band on something, I'll probably put it up for sale at some point. 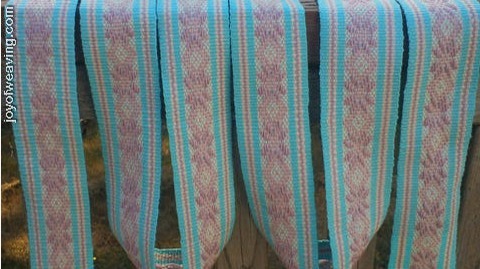 The dusty rose and robins egg blue yarn used is cotton and was sent to me from Brazil. The white is Aunt Lydia's #10 cotton.